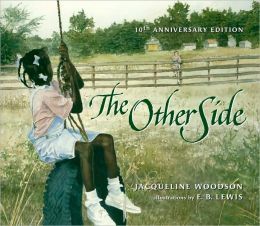 This classic picture book tells the tale of two little girls, one African American, one European American, who live on either side of a long fence. The fence does more than divide their yards; it divides their whole town. It is the kind of fence that grown-ups build, but doesn’t make sense to kids. So they are told, “Don’t climb over that fence. It isn’t safe.” But, no one tells them they can’t sit on that fence. As they do, a friendship begins. This book is beautiful, both visually and textually. The language is spare, straightforward and leaves the reader a sense of having experienced the world through a child’s eyes. The water color illustrations are gorgeous and compelling. This book is one worth keeping in your personal library. You will use it again and again. It would fit easily with a sermon exploring the present day fences we encounter in our world and the ways in which we might venture to and beyond those fences.